Now you can enjoy the highest quality, freshly roasted specialty coffees shipped directly to your home or office! 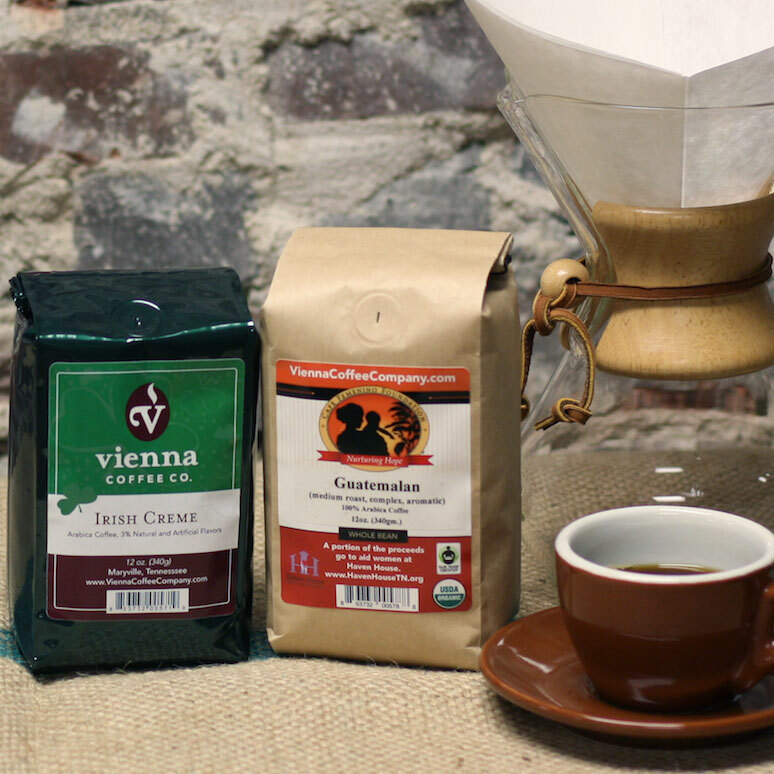 Vienna Coffee Company is a Craft Roaster and Member of the Roaster's Guild of the Specialty Coffee Association of America (SCAA). Celebrate International Women's Day this year on March 8th and buy a bag of our Organic, Cafe Femenino Guatemala coffee which not only supports women at Haven House Blount County but also women farmers in Guatemala! Looking for flavored coffee? Then check out this month's flavored coffee: Irish Creme. We roast daily in small batches using only the finest gourmet coffee beans, imported from throughout the tropics. We offer espresso, single-origin and estate coffees, rich flavored gourmet coffees, USDA Certified Organic, Fair Trade, Shade Grown, Bird Friendly, Rainforest Alliance Certified and water decaffeinated coffees as well as our own private blends. For more information about our coffee products, our roasting techniques, our full line of fine teas or anything you need to set up your own espresso shop, please contact the Roastmaster John Clark at (865) 681-0517 or via email. Visit us at the Roastery and coffee House in Maryville! or at the new coffee house at the regas building in Knoxville! Each month we bring you featured coffee and a flavored coffee of a month. Check it out today! We serve premier espresso drinks, (Mocha, Latte, traditional Cappuccino) crafted by serious Baristas and freshly roasted specialty coffees. We strive to DELIGHT the customer with every visit! In addition to great coffee, we serve up a variety teas, chai, smoothies, steamers and lots of fresh baked goods made in house or from local bakeries. We offer free Wi-Fi and we have live entertainment weekly, whether it’s a local musician or folks playing for open mic night. We hope you stop by to check out the great selection of treats and cozy atmosphere!